The Digital Surface Model? What is it and what can you do with it? As a UAS service provider, the team at Menet Aero cuts across a wide spectrum of customer involvement with UAS data. Our experience shows that while some customers would like an end to end solution with UAS data, others want to work with the data in their own geospatial software of choice. In any case, we always provide the customer with some standard data outputs so they understand the data is not ours, but theirs to do what they want from it. Before each job, we like to find out from the customer what type of solution they are looking for from this drone data so we can best determine what to provide them, and to be sure there are no expectations from the data not met. 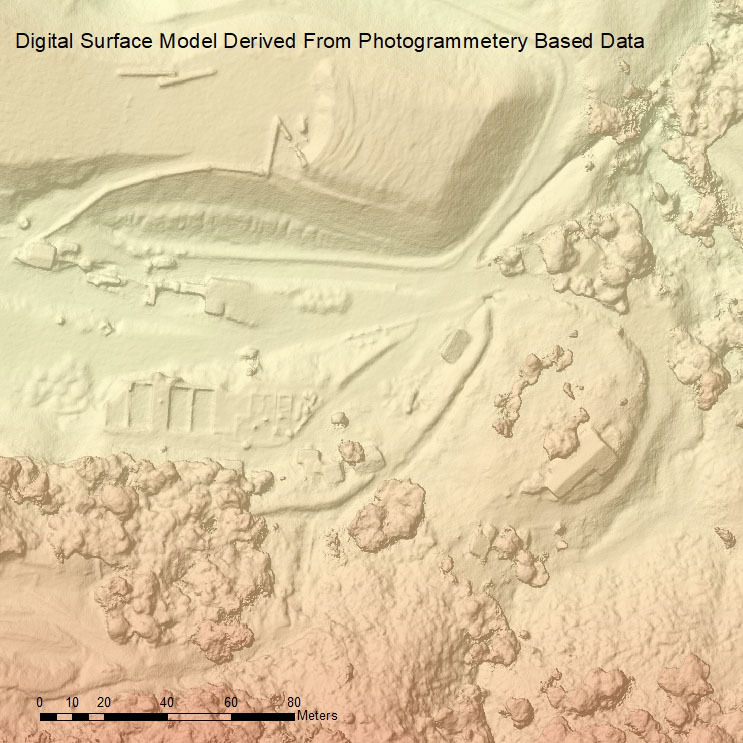 Other than high resolution imagery, the most sought after data related to processed UAS data related to topographic data related to the Digital Surface Model, or DSM. 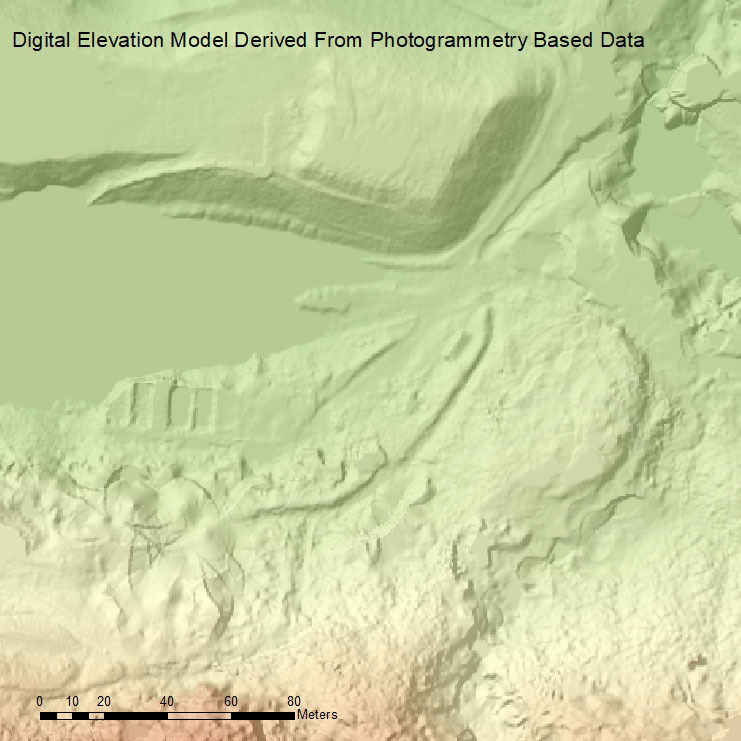 The purpose of this blog is to clarify what a digital surface model is, and how it relates to some other similar elevation data products. Before we continue with an explanation of a digital surface model (DSM), we need to briefly get into how a bunch of pictures taken from a UAS camera can be turned into a 3D surface. All of this is related to the practice of photogrammetry, where stereo pairs of images are used to create a 3D image. (Think of going to the eye doctor and being asked to pinch the fly wing when you are forced to put on those goofy looking 3D glasses). If you take this same concept, you can think of telling the UAS to fly a mission where each picture taken has at least 75% overlap between the images. Yes, with more overlap you get better results, but that means a longer flight, and more images to process. (I like 85% front overlap, and and 80% side) Now if these overlapping images are placed into a Bundle Block Adjustment Software, the computer will take matching pixels from the images and generate a 3D point cloud. This is the Claude Monet data product of the geospatial world. Like a dot stippled Monet painting, from far away all those points make up a 3D surface, but as you zoom you see this surface to really be composed of a bunch of points. 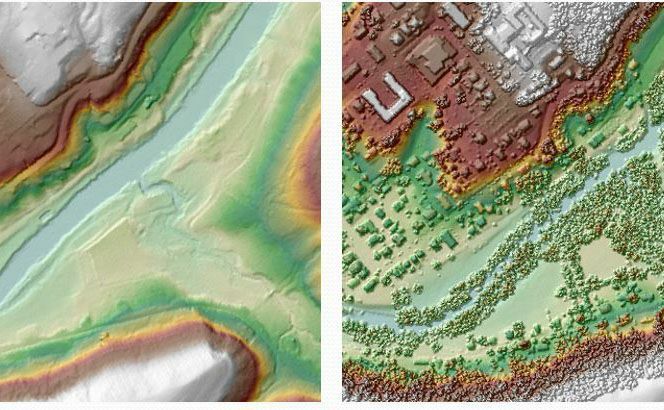 The point cloud is format is commonly an .las type file, which means you will need specific software to view/work with it, but many of the more geospatial savvy customers we work with like it for incorporation with other types of data and being work with it in other ways. The point cloud is more or less the foundation upon which the DSM is created, since the DSM is nothing more than interpolating a continuous surface from a photgrammetrically derived point cloud. I understand that some eyes are already glazing over here, so let me me explain that last statement a bit more, and unfortunately, that means a few more geospatial type acronyms. I'm going to start with going back in time a bit, to a time where the science and practice of photogrammetry was not all about fast computers and digitally derived data products. We go back the days where photogrammetry meant staring at two overlapping images with stereo pair glasses, and creating topographic surfaces from that. This method is also not THAT old. Indeed, I spent many a day in the 1990s drawing out contour lines, and later on, in the early 2000s, delineating soils based on differences in vegetation and elevation through stereo pairs. This stereo pair method is ultimately what was used to create the detailed contour maps that many of us have at one time used, and those very contour maps were used to later create Digital Elevation Models (DEMs). Here is where the confusion comes in since both a DSM and DEM were created through photogrammetric methods. There is a big difference between the two, however, since a DSM contains elevation values of everything on the surface; ie buildings, trees, cars, sleeping pets, etc. A DEM, by contrast, contains only surface elevation values with buildings,trees, cars, pets, all removed so the bare ground is what provides the elevation. So, here the question lies if one could convert a DSM into a DEM. The answer to that is yes, but with many caveats, and this starts with bringing LiDAR technology into the fold of the discussion. If you are still with me, and not thinking that I, you, or both of us need to take on another hobby, let me introduce just a few more acronyms, and relate these to LiDAR technology. Light Image Detection and Ranging, or LiDAR is very much the holy grail of the UAS world, and the same principal of generating insanely high resolution data sets is the output. The difference between photogrammetrically derived data from a camera sensor on a UAS and that from LiDAR is that the signal is the strength of the LiDAR signal, and its ability to penetrate through forest canopy to the surface. If one were to examine the point clouds (back to that .las file) from UAS photogrammetric data and that from LiDAR, you would notice that the UAS data captures vegetation, but there are no bare ground elevation values. This makes filtering out the vegetation, but leaving the bare earth is problematic for photogrammetric UAS data, and means lots of elbow grease, and interpolation for these voids in the data set. 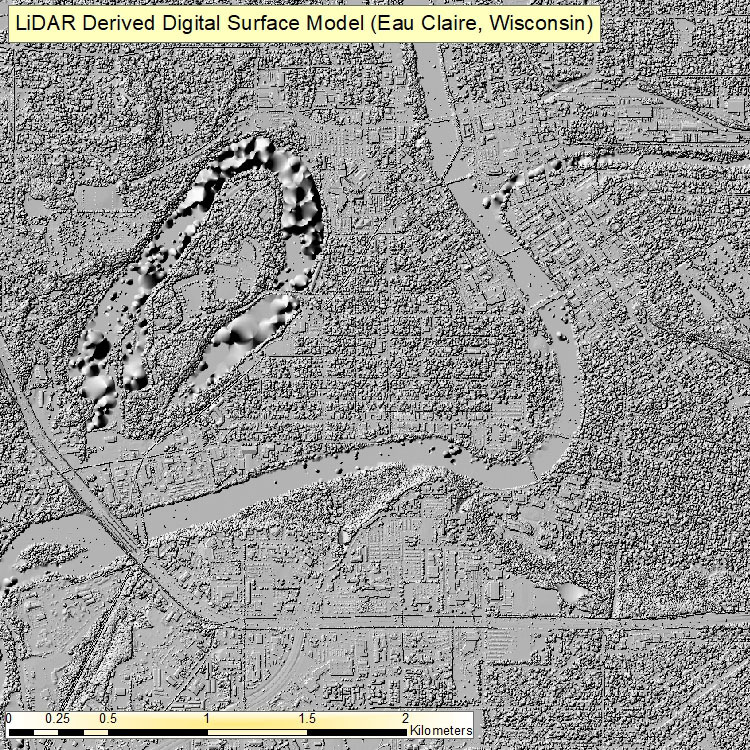 LiDAR data, on the other hand, will provide not only the vegetation as a classified set of points, but also the surface, the water, buildings, and useless 'noise'. 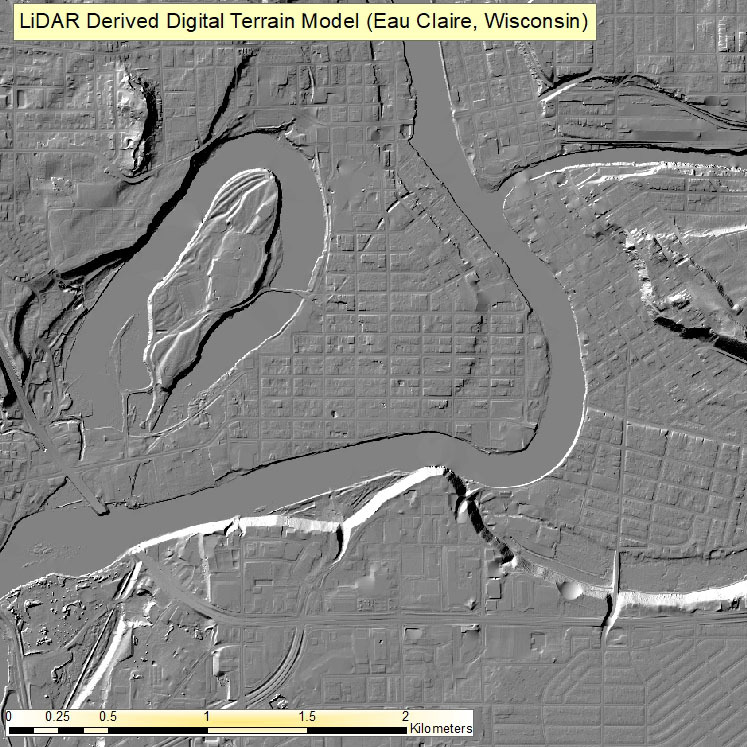 This allows for the user to filter out that bare ground to produce what is known as a Digital Terrain Model, or DTM. Both LiDAR and photogrammetrically derived UAS data produce DSMs, but know that a DSM coming from a UAS camera sensor has its limits. In areas with lots of exposed bare earth, such as in construction or mining, the cost of a UAS flight and its associated data processing is miniscule when compared to what it costs to have a LiDAR mission performed and the results will be just as accurate. If, however, you are a forester looking to perform biomass measures and create a Digital Elevation surface of the bare earth below a dense canopy, please consider that photogrametric UAS data may not be a viable solution. Before I conclude, I want to acknowledge that yes, there are LiDAR sensors that have been put on a drone, and the cost of these sensors continues to go down, but from a wholly practical standpoint, LiDAR is still very expensive, and still very limited when it comes to being used on a UAS platform. Menet Aero is continuing to monitor developments in the LiDAR and UAS world and see the massive potential for when these two technologies become practical for use in the rapidly expanding UAS commercial market place. Until then though, a photogrametrically derived DSM is great for those in the mining, construction, and other excavation industries where exposed bare earth eliminates the problems of dense overhead vegetation. An Open Letter To UAS Venture Capital: One-Click Solutions Are Not The Answer.